Wild-caught and farmed sustainably, scallops make a perfect seafood choice that helps protect our natural resources. 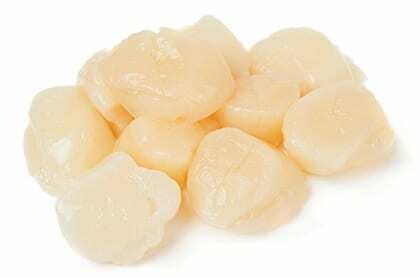 With a rich, sweet taste and firm, unique texture scallops are culinary bliss for seafood connoisseurs and your customers will be delighted to see them on your menu. Whether you decide to order sea scallops or bay scallops, both offer a unique delicacy for an appetizer or entrée. A traditional favorite is seared scallops, which bring out their rich taste without compromising moisture content. Scallops only need a short amount of time to cook to create a culinary masterpiece. They may also be steamed gently, baked, broiled, fried or made into ceviche by adding lemon or lime juice to raw scallops. Any of these methods will produce a perfect dish for your diners to rave about. Scallops are farmed sustainably worldwide. Like other filter-feeding shellfish, they do not require fishmeal or fish oil to survive – only natural ocean water rich with plankton. They are usually farmed in their native habitat, so there is no risk for invasive species to escape the farms. Farmers do not need to use chemicals or antibiotics. With excellent management and environmentally friendly techniques, farmed scallops are superbly sustainable seafood. When wild-caught, there is concern for bycatch and habitat damage from dredging, but many fisheries have resolved these issues by implementing proper regulation procedures. If you seek to add a high quality, delicious delicacy to your menu that your customers will love, look no further. We guarantee that our scallops are simply amazing in taste and sustainability. Pucci Foods puts our clients first by providing healthy seafood sourced with ocean friendly methods. Order your wholesale scallops by completing the form on this page and a member of the Pucci Foods team will be in touch soon.